The quiz is an annual feature and a rolling trophy will be presented to the winning team along with other exciting prizes. The quiz will include various topics on General Knowledge, Heritage & Culture, Current affairs, identifying the artifacts etc. 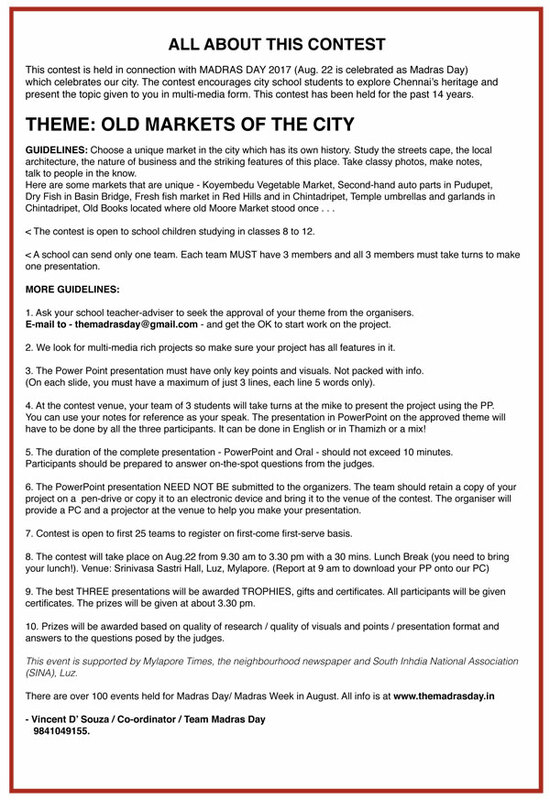 There will also be audio-video and buzzer round. The program is open to students of 6th, 7th and 8th Standards from Matriculation, CBSE and ICSE schools. At DakshinaChitra campus in Muttukadu. At 10 a.m.
YOCee is organising an event ‘A Day at Fort St. George’ for children in association with The Archaeological Survey of India on August 20, 2017. From 9.30 a.m. to 12 noon. The event will have a short guided walk inside Fort St. George Children to know about the buildings and monuments and stories behind them. This will be followed by a Spot on Mapping session and a quizzing session. The event is open to children studying in class 5 to 12. Limited to 30 children and registration is mandatory. Participants need to carry a photo ID or School ID card. To register, contact Revathi R at 9840544629. 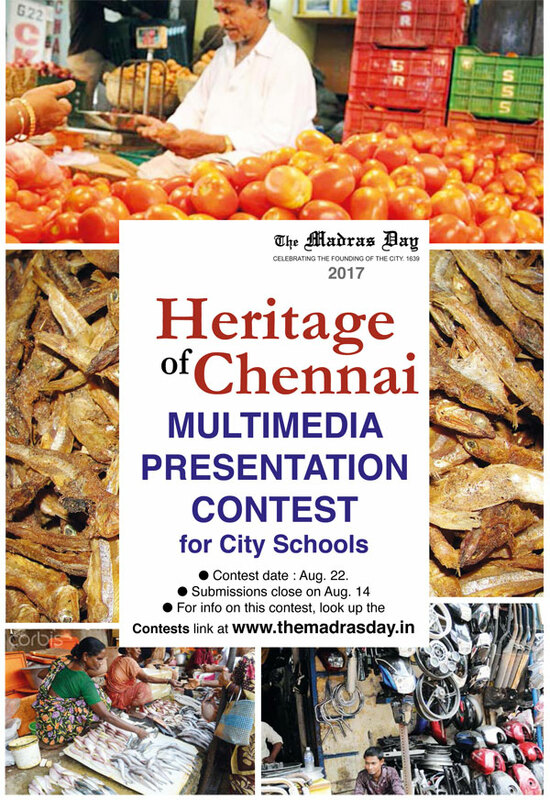 Yocee (http://yocee.in) conducts a 9th annual Madras Day photowalk for children on Aug. 26, 2017. Are you game to witness and record the MRTS & Metro together? Are you game to Check the Fish Market (closing your nose already? ), the Zion Church? the Sandalwood Garland Market (Now open the nose)? Adhipureesswarar & Adhi Kesava Perumal in the same compound? the Jain Temple? The Autorickshaw Repair street? and the Gaiety & Casino or what’s left? Starts at 4 p.m. and ends at dusk. For children of 10 years and above. Free walk. Register with Revathi at 9840544629. Open only to first 25 registrations. Come listen to the story of how the city came to be founded , the people who played an important part, what brought them here and how Madras grew over the years. Kreeda and the Ramanujam Maths Education Centre organises a workshop on Traditional games and the Maths behind them. On August 22, 2017. From 10 a.m. to 1 p.m.
Start with a 4 generation family tree (minimum), add pictures, plan of your house (before and now), write stories, add function invitations, postcards, sketches etc – and how your family moved to Annanaga. When? How? Why? How your family history is related to Annanagar. For children in junior and senior categories.